Take a quick look around your apartment and think about what it looks like. Are the walls void of any decorations? Does it feel a little boring in there? If you answered yes to either of these questions, keep reading. You could paint a wall or two to liven up your living space, just be sure to check with the office before you start (plus you'll have to prime them when you move out). But for those who aren’t inclined to paint or don’t want to spend hundreds of dollars on decorations and artwork, we’ve found 7 DIY wall art projects that just about anybody can do to add some excitement to those boring walls. Check a few out, and let us know which ones were your favorites in the comments section! SPOILER: Not made with actual watercolor paint! Learn how to replicate that awesome watercolor look in a stylish, modern pattern by using a canvas, some masking tape, spray paint, and acrylics. 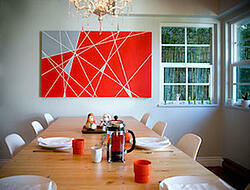 Looking to add a little modern, contemporary flair to your room? 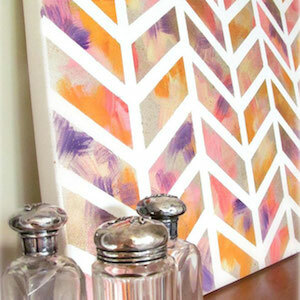 Check out this simple, yet stylish painting that only requires a canvas, some tape, and some paint. Hint: You can use your computer’s Paint program to easily plan and experiment with your design. Got a pile of scrap paper lying around and don’t know what to do with it? This project is just for you. 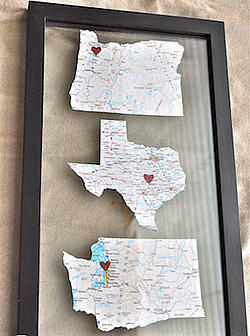 All you need is a hole puncher, some paper, glue, and a picture frame. The project is easy, the design is simple, but the outcome is excellent. 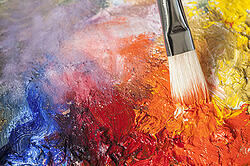 Experiment with different colors, themes, and patterns to really get creative. 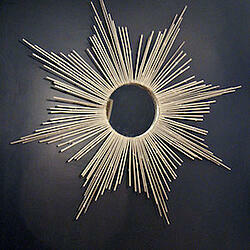 This easy-to-make piece is a wonderful way to accent your room and add dimension. 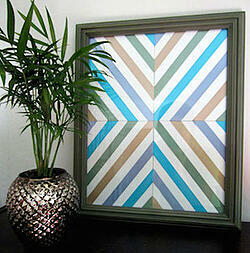 The clean, crisp, color-changing lines are eye-catching, and look great inside a thick frame. All it takes is some double-sided tape, poster board, and ribbon. If you love the look of old theater signs, you’re definitely going to love these. 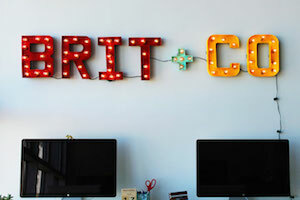 Using some pre-made cardboard letters and globe string lights, you can put your name up in lights for everyone to see. The vintage look is a unique way to grab attention and literally brighten up your walls! Are you someone that’s moved around a little bit? Show off all the places you’ve been with this clever project. All you need are some maps, stickers, and a frame, and you’re all set. 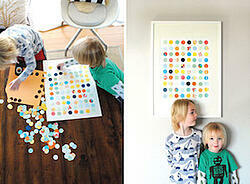 Looking to fill up some wall space and liven up that simple little mirror of yours? A sunburst mirror is the perfect solution. Unlike the other geometric designs on our list, this project is slightly more abstract, but equally elegant. You just need a mirror with a flat frame, some sticks, hot glue, and paint.